In this sri rama stotram collection, I am giving some most popular slokas or verses for worshipping God "Sri Rama" who is an incarnation of Vishnu during Treta Yuga. There is also one most powerful mantra of Rama (known as Sri Rama Rama Rameti mantra) that brings huge benefits for you. It is believed that Lord Shiva revealed this mantra to Parvati when she asked for a shorter version of Vishnu Sahasranamam. It is given as the fourth lyric under each of the three language options below. aapadaam = troubles, apahartaaram = destroyer or remover, daataaram = bestower or giver, sarva= all, sampadaam = wealth, lokaabhiraamam = chief or Lord of lokas (all worlds), Shri raamam = to that Sri Rama, bhooyo bhooyo = again and again, namaamyaham = I am paying respects (by folding hands or prostrating on floor). I pay my respects or salutations to Sri Rama, who is the remover of troubles and the bestower of all wealth and one who is the lord of all worlds. 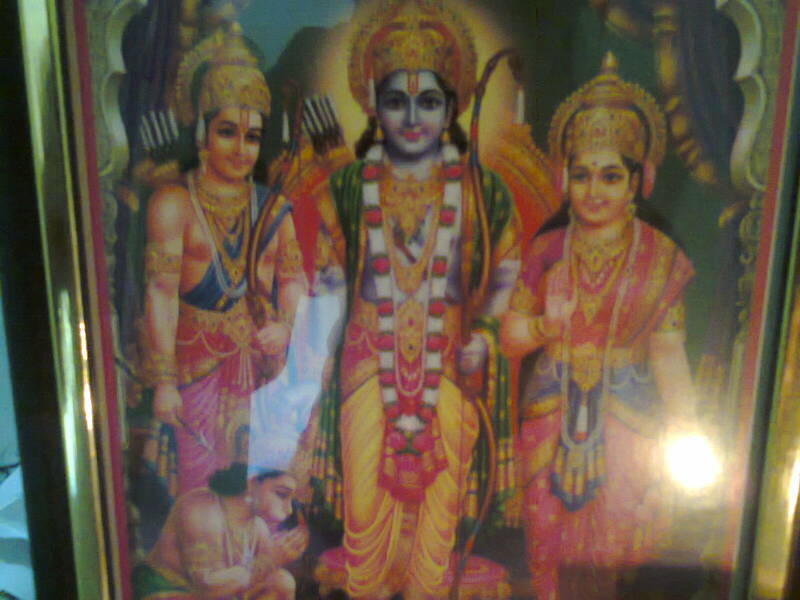 Raaghavam = Rama is known as Raghava as he was born in Raghu vansh clan. Dasharath = father of Rama, aatmajam = born to or son of, aprameyam = non disputable, seethapati = Sita's husband (pati means husband), raghu kulaanvaya = descendants of Raghu kula or dynasty, ratna deepam = jewel light (one who shines like jewel), aajaanubaahum = one having arms touching to the knees, aravind = a lotus flower (I hope it is purely white flower), dala = petal, aayata = width or wide, aksham = eyes, raamam = Sri Rama, nishachar = night wanderers (demons), vinaasha karam = one who destroys, namaami = paying respect. I am saluting to Sri Rama, who is known as Raghava, indisputably the son of Dasharatha and husband of Sita, the glowing light (like a jewel) of the whole Raghu kula dynasty, one who possesses arms touching to his knees (it is a virtue for men), and his eyes wide open resembling petals of pure white lotus flower and who is the destroyer of all demons and evil spirits. Raamaaya = to Rama, raamabhadraaya = one known as Ramabhadra (Rama stayed at a hill known as Bhadrachal. So he is known as Ramabhadra), raamachandraaya = Rama shines like the moon. So he is known as Ramachandra., vEdhase = in the Vedas (Veda is a holy scripture), Raghu naathaaya = among all raghuvansha kings, naathaaya = he is the Lord, seethaayaa pataye = husband of Sita, namaha = salutations. My salutations to Rama who is also known as Ramabhadra and Ramachandra, who is mentioned in Vedas as the greatest lord of Raghuvansha and the whole world, and who is the consort of Sita. This is actually a mantra having the full powers of Vishnu Sahasranamam. This sloka was actually disclosed by Lord Shiva himself to his consort Parvati. Parvati was too much alarmed about the ignorance and the agonies faced by people. When God imparted the Vishnu Sahasranamam as the only remedy for people to get rid of their worldly sins and troubles, Parvati got worried. She felt sorry for the layman who cannot recite those highly standard verses. So, she asked her Lord Shiva to provide a simplified version of Vishnu Sahasranamam. Then, Shiva disclosed to her about the power of the word "Rama". He tells her that taking the name of "Rama" three times is equal to the recitation of the whole text of Vishnu Sahasranamam. So, here goes the meaning of this powerful mantra. ramE = to play or enjoy; raamE = beautiful play with the word of Rama; manOramE = Hey Parvati; (who is good looking and appealing to the heart and soul), sahasranaama = 1000 names; tattulyam = equals to; raama Naama = Rama's name; varaananE = is gifted with. So, the full essence of this 4th hymn"sri rama rama rameti sloka" is that taking the name of "Rama" three times is equal to and is empowered with the powers that can be obtained by way of reciting the entire 1000 names of Vishnu. Know this fact, You, O Good looking Parvati!